I have entered my first writing competition. I submitted my paragraph online and have been waiting for this day. Today, the contest ended and the evaluation of the hopeful has begun. There are many reasons to enter a writing competition. It forces you to actually write and produce something worth reading. It allows a wider audience for your work. It is a good way to test the water of the broader writing community. It forces you to write carefully and critically. While those are good reasons to compete, none were my motivation to enter. I entered my first writing competition because I wanted to win. 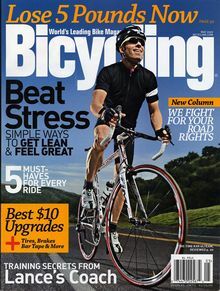 The April edition of Bicycling magazine was their annual buyer’s guide. The issue contained 123 reviews of the latest and best that the world of bicycling manufacturers has to offer. The competition was to enter a 150 word, cycling-themed, parody of Bicycling writer Bill Strickland. The winner of the competition will get to choose any bicycle reviewed in the April edition that has a suggested retail price of less than $5,000. Since entering my 150 words, I have spent way too much time thinking about the prize. I have gone through ridiculous evaluations between the merits of the Guru Photon SL and the Felt F2; considerations of which would be better for my riding, the Trek Madone 6.2 H1 or H2; the Specialized S-Works Roubaix SL4 is way over the $5K limit but maybe they would work me a deal. I was surprised what all this prize contemplation wrought when I took the humble seat of my Fuji road bike for my latest ride. I rode along a familiar route in the crispness of the spring morning, past pastures of frolicking calves, accompanied by the harmonies of a thousand song birds, yet completely engrossed by how much better a ride on a prize bike would be. I realized the surprising level of disappointment that was crouching at my doorway when I considered the likelihood of not winning the prize bike. I had allowed the fun possibility of winning a writing competition turn in discontentment. I own two very nice bicycles. My bikes are not the limiting factor of my cycling. I don’t need a $5,000 bicycle. 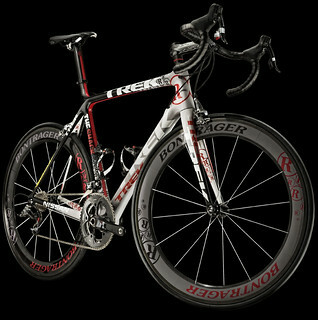 I can’t justify a $5,000 bicycle. Yet, I want one. How foolish will it be for me to be disappointed if I am not elevated from my humble road bike to the exalted saddle of a prize bike? An amazing level of discontentment can arise when all we focus upon is what we don’t have, rather than what we do. Jesus told the parable of the wedding feast and how people chose the places of honor. He instructed us in a level of humility that selects for ourselves the lowest place of honor. Then, when the host comes and recognizes our lowly status he will move us up to a higher place of honor. The parable is a wonderful image of how we are humbled when we exalt ourselves and how we are exalted when we humble ourselves. However, what happens if no one comes to raise us up? It is often easy to see those who exalt themselves in their desire for honor. There are some who insert their resume of spiritual prowess into every conversation. Those overt challenges for the high seats of honor are easy to identify. However, the subtle pride of feigned humility is often much more difficult to capture. We can become masters of contrived humility, spoken in anticipation of elevation. This more socially acceptable variant of honor seeking pride is exposed when we do not receive the anticipated response. …when you are not acknowledged? …when your advice is not sought? …when you’re not asked to lead? …when self-deprecating statements are not countered? …when no one asks what is wrong? …when your value is not extolled? How do you respond when you are not elevated to a seat of honor? Feigned humility allows discontentment to fester in anticipation of being elevated to the seat of honor. We can become so engrossed in winning the prize of people’s honor and praise that we fail to appreciate the seat of honor we, as followers of Christ, have already been elevated to. We have been elevated to sit at the Lord’s Table as an heir. Is there any greater honor? We have been given the greatest prize the world has ever known. Let’s not wallow in the sinful discontentment of seeking the lesser prize of man’s praise. I went through the same wild roller-coaster ride when I self-published a book. Time and experience bring us back to earth. But someone has to win; maybe it will be you. If not, the striving for it has taught you something. That is very true on both accounts. Wonderfully probing and insightful…well-written, too. Great post, really enjoyed that. Sometimes we fail to appreciate what we have when contemplating losing what we never had. I loved your story about the writing competition – well written! Thank you for your honesty. You have won already if you have countered the false humility that creeps into our hearts. That is so very true. 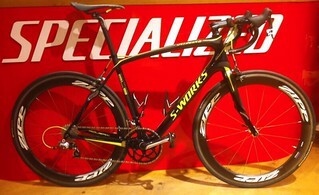 It is worth more than any bicycle. Best of luck to you with the contest! Just please remember, there are lots of others and go for them!! Oh, I don’t know about doing any other writing competitions. Putting a blog post out is challenging enough for me. Thanks – if nothing else, it was fun to write my submittal.